This website has been comprehensively updated in 2018 to keep up with the scientific and clinical advances in this field. It is intended for people with borderline personality disorder, for those who think they may suffer from it, for their families, and for psychiatrists and other mental health care providers who strive to help them. 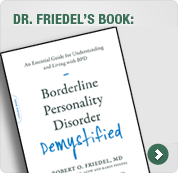 I have selected information about the disorder that will provide you with an increased understanding of the symptoms, history, causes, and nature of borderline disorder. It is also important that you are aware of the various methods of treatment now available for borderline disorder, as well as of their effectiveness and risks. Finally, it is useful to know how to locate resources and other information that will provide you with additional help. People Suffering from Borderline Disorder: A major purpose of the website is to help restore hope to people with borderline disorder and to their families and friends. It is also for those who believe they might be suffering with the disorder, and to help guide you toward an accurate diagnosis and an effective treatment program. Family & Friends: If you are a family member or friend of someone with borderline personality disorder, you also are probably seriously affected. This site is intended to provide useful information for you as well. Psychiatrists and Mental Health Clinicians: It is difficult for psychiatrists and other mental health professionals to knowledgeably disregard the myths about the disorder, and to keep abreast of the latest advances in the diagnosis and treatment of patients with borderline personality disorder, and frequently co-occurring disorders. The information on this site is intended to help you to do so readily. Reason to be encouraged if you or a loved one have borderline personality disorder. Research offers us the best reason to remain hopeful about living more comfortable and productive lives with borderline disorder. More scientific articles have been written about the disorder over the past three decades than in all previous decades combined. The new technologies of modern medical research are now being used to study the disorder. Information from this research sheds new light on the causes, nature, symptoms, and treatments of borderline personality disorder. More psychiatrists and other mental health professionals are becoming aware of the clinical significance of borderline disorder and learning how to treat it effectively. If you have borderline disorder, do not lose hope. Persist in your efforts to find a psychiatrist, or another physician or mental health professional that understands and is trained to treat patients with the disorder. Participate actively in the development of your treatment program, and then stick to it. If the treatment program does not appear to be effective in some way, or if you are experiencing side effects to medications, discuss these problems with your doctor. Ask for and accept the help and support of your family and friends. Work with them because they are an important part of your life and can play a significant role in your continued improvement. It takes great courage to struggle with the symptoms of borderline personality disorder, but do so with the knowledge that others with the disorder have gained much more control over their lives and are consistently happier than they ever believed possible. For many reasons, including the fact that my sister suffered from borderline disorder, it is important to me that I try to be of help to you in your quest.